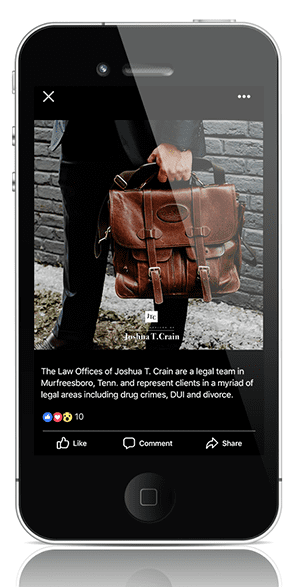 The Law Offices of Joshua T. Crain engaged Adams + Swann to assist with a new brand image along with digital lead generation. Adams + Swann designed and developed a brand identity system that is consistent with their cutting-edge and strong style, all the while replacing a dated style that no longer served their mission. Coinciding with the fresh new look, Adams + Swann developed a mobile responsive website which matched the style they were hoping to achieve, with various aspects of digital lead generation capabilities. New signage, stationery and business cards were designed to complete the brand image overhaul to setThe Law Offices of Joshua T. Crain apart from a crowed market. 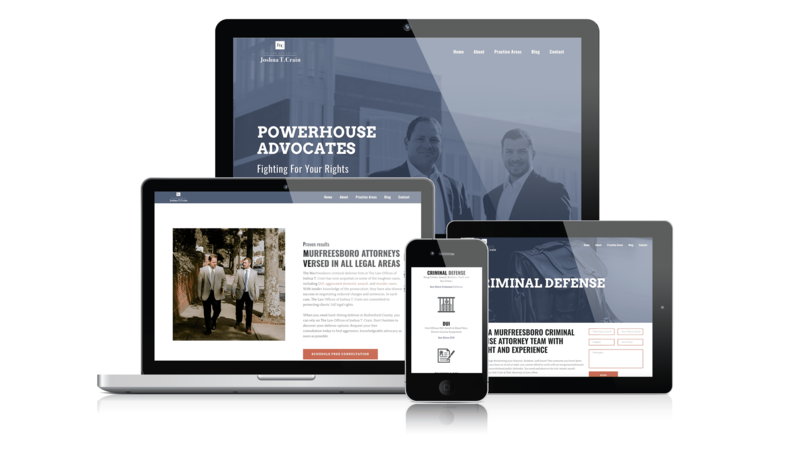 The Law Offices of Joshua T. Crain take their brand seriously and wanted a website which displayed their personal style in an aggressive and authoritative way. They fight aggressively for their clients, in turn, they wanted to show these traits through their website design. Using modern website design elements in a straightforward and easy to navigate way, Adams + Swann delivered a website that set their brand image firmly in place and created opportunities for new lead generation through clear calls to action. 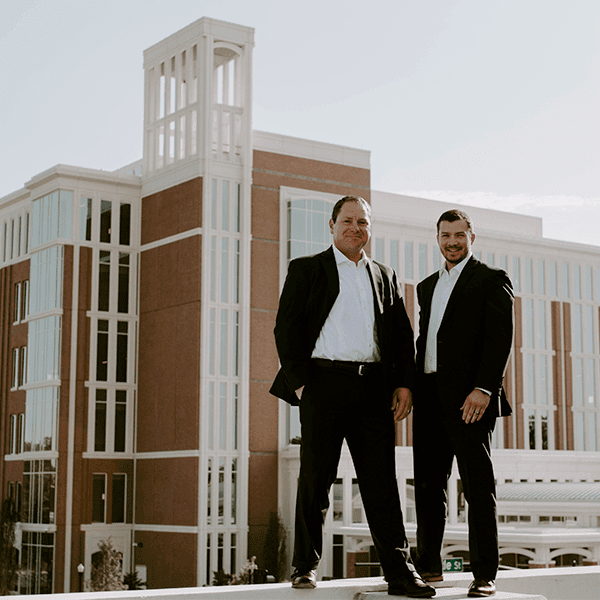 Adams + Swann used custom photography to show the distinct personalities of attorneys Joshua Crain and Jacob Flatt, and the office atmosphere. Adams + Swann used their expertise in organic SEO practices to build a site that would produce incredible results long term in the areas of organic search placement. 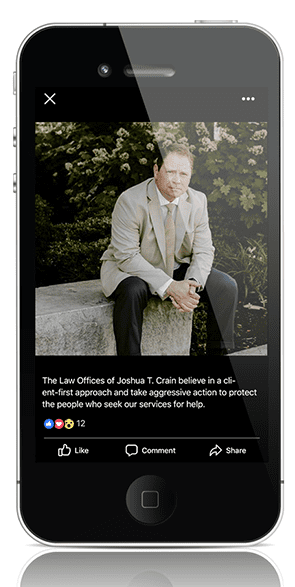 The mobile responsive website was built so clients on all devices can quickly and easily find the information they need in order to contact The Law Offices of Joshua T. Crain for legal services. Adams + Swann created a brand system that stands out in a competitive market for criminal and divorce legal services and was comprised of a clean and professional logo mark with an unexpected aggressive twist. By utilizing a shark fin as a show of an apex predator, Adams + Swann achieved the brand image the attorney team desired. Adams + Swann advised the attorneys on new uses for their logo mark including office signage, business card design and stationery design. Upon completion of the new website and brand image, Adams + Swann embarked on Google AdWords and Facebook campaigns to drive traffic and prospective clients to crainlawtn.com. Adams + Swann is also working on a continuous basis on organic SEO placement for The Law Offices of Joshua T. Crain, achieving top level placement across multiple keyword sets.